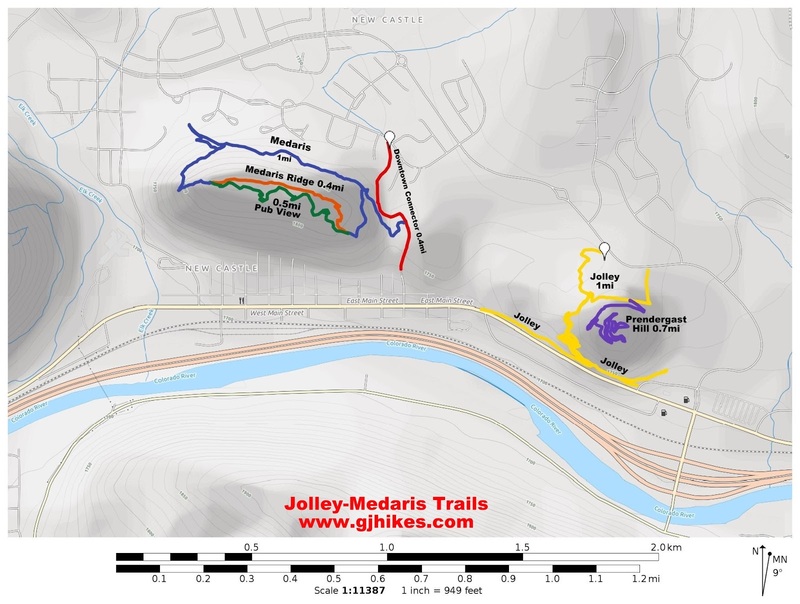 The Medaris group of trails are located in the heart of New Castle, Colorado. Various loops can be formed that go around and over Mount Medaris, a prominent hill in the Grand Hogbacks Ridge at a point that separates the downtown area from Castle Valley. 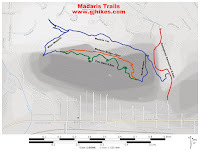 The various trail segments that include Medaris Ditch, East Medaris, West Medaris, Medaris Ridge and Pub View are open to both hiking and mountain biking except for West Medaris which is open to foot traffic only. For this post we parked at Hot Shot Park and headed down the paved C Avenue trail that leads past the east side of Mount Medaris to the downtown area. The C Avenue trail is just over a half mile long. 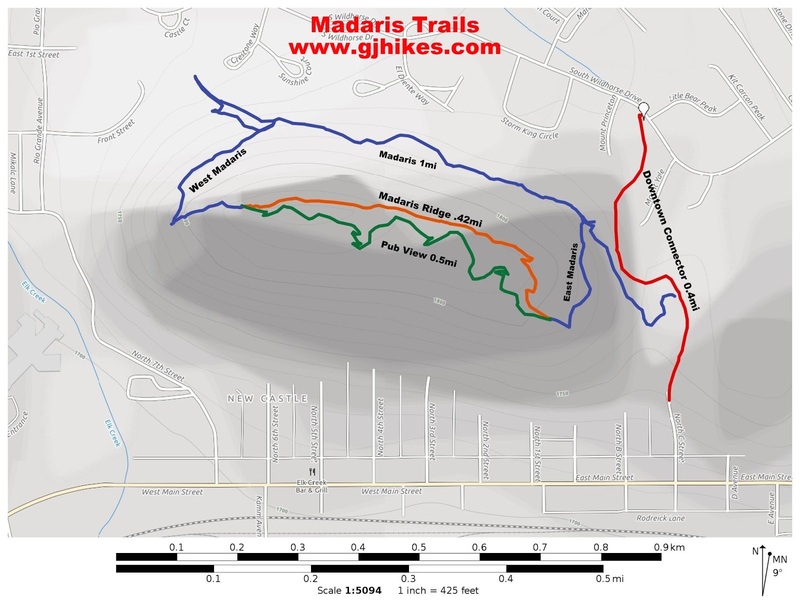 It has two connections to the Mount Medaris trails. The first connector is only a few hundred yards from Hot Shot Park. For this post we started around the north side of Mount Medaris on the Medaris Ditch segment. This portion of the trails has mostly minor elevation changes. Part way around the mountain the Salty Dalty trail branches off on the left where it heads up and over the east end of Mount Medaris. As the trail continues around the mountain there are some nice views looking up East Elk Creek. The West Medaris trail segment branches off on the left while the Medaris Ditch trail continues down to where it enters a nearby neighborhood and comes to an end. West Medaris has some very memorable stretches of steep narrow trail that lead up the side of the mountain where the trail drops off very abruptly toward the valley below. The exposure here might be more than some hikers will care for. The trail briefly levels off at a rocky outcrop where there is a nice view of the Colorado River corridor. The final stretch of the West Medaris segment climbs the rocky ridgeline up the west facing slope. This portion of the trail is fairly primitive but it has some great views. The West Medaris trail ends when it meets up with the Medaris Ridge and Pub View trails. Both routes are a lot of fun and each has its own advantages. Whichever route you take both trails meet back up again on the southeast side of Mount Medaris. At this point the East Medaris trail continues back to where the loop began. The Salty Dalty trail also joins in at this point. 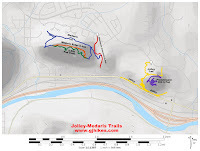 The Mount Medaris trails are a nice mix of hiking and mountain biking trails around New Castle. They are also open to horseback riding although we didn't notice that any equestrians had been there or that there were any suitable places to park a horse trailer. If you would like to see them for yourself then all you have to do is grab your bike or 'Take a hike'.